So what does a Social Media Marketing Agency even do? So what exactly does a Social Media Marketing Agency do? Facebook user see an amazing offer on a Facebook ad and clicks to learn more. The user is then redirected to an opt-in page that is only designed to get their name, email, and cell phone number, in exchange for the offer. Once the user enters their information, they are taken to a Thank You page, giving them instructions on how to claim the offer as well as an incentive to do so immediately. Once they land on that Thank You page, they’ll get an email and text message with instructions on how to claim their offer. Part 1: A Jaw-dropping offer (JDO)—a narrowly targeted, irresistible sales offer that compels the target audience to take immediate action. Think of it as a product or service of perceived high value your client can offer for free or of little cost, getting new customers in the door. To help decide what things are within your client’s scope to offer, you need to know the customer lifetime value and the minimum viable product. For example, if you had a dental client, their JDO could be a free teeth-whitening session. It doesn’t cost them a whole lot of money or time to offer. Yet, if they can get the customer to return or pay money by way of an up-sell, they’ll make that initial free offer entirely worth it. 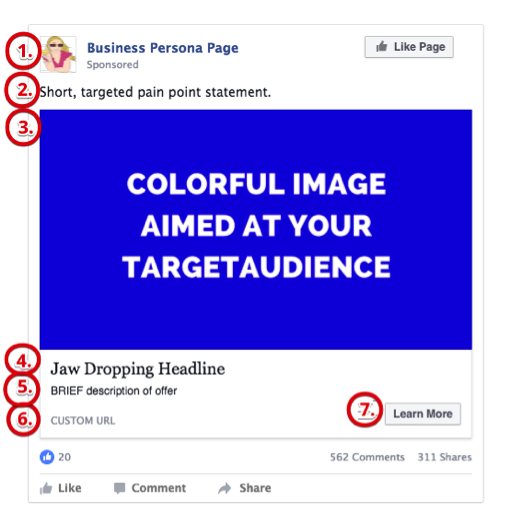 Part 2: The Facebook Ad—once you’ve narrowed down the JDO, it’s time to create Facebook ads to promote it. And, when you’re making your ad campaign, there are seven specific components you need to include to ensure it’s successful. Main ad copy: less is more. After all, the goal of your ad is to drive clicks, not tell them everything they need to know about the offer. Targeted ad image: a high-quality, professional image that’s colorful is necessary in order to catch the attention of viewers while they’re scrolling through their News Feeds. Jaw dropping headline: keep this short and to the point. Ad description: don’t go any longer than two sentences. Sum up the main offer and add a bit of scarcity (ex. Limited spots available! ), urging viewers to click now instead of tomorrow. Custom URL: ensuring you have a custom URL for your page will save you money. That’s because ads with extensions such as .leadpages will be rated poorly by Web of Trust, resulting in your ad getting charged higher rates on Facebook. Call to action button: tell your user exactly what they should expect when they land on the other side of your ad with a succinct and relatable call to action. Think Download Now, Learn Now, Book Now; you name it. Location: use the client’s town name as the base location and adjust the mileage from there. For a restaurant or gym, we advise keeping it inside a 10-mile radius. For a dentist or similar service, extending the radius to around 25 miles is the sweet spot. Age range: use the 20-year rule, keeping the age range within a 20-year span. That way, there’s a better chance the audience will have more things in common as they’re closer in age. Gender: most of the time, we suggest going with either male OR female. Not both. Detailed targeting options: there are a lot of cool options when it comes to this—what users post to their timelines, apps they use, ads they click, pages they engage with, and more. But, don’t go crazy. Only use options that directly relate to the person you’d like to target with your ad. Budget: always remember to start low and scale the ad spends from there. We recommend starting at $5 a day to give the ad time to mature within Facebook’s ad algorithm. If you see your ad performing well after 72 hours, start increasing the budget 20-30% every few days. Part 3: The Funnel Pages—after clicking on your ad, leads will wind up on a series of funnel pages to accomplish one thing: opt-in to the next stage of your funnel. After the reader clicks the Submit button on the opt-in form, they’ll be taken to the Thank You page to wrap things up. This page is very similar to the opt-in page, with only a few minor changes. 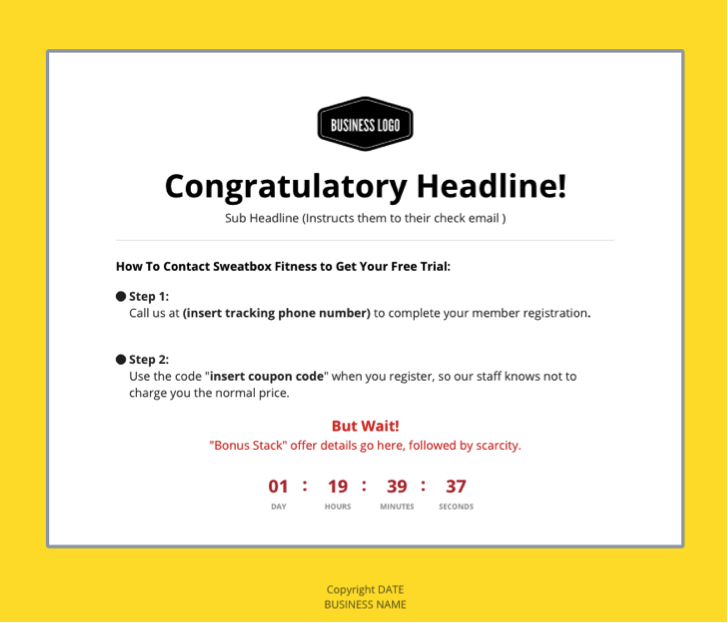 A “bonus stack” with added scarcity—a feasible added freebie or special offer if they contact the business to claim the original deal immediately. It ups the ante, so to speak. Take a look at this layout example of a Thank You page. Part 4: The Follow-Up Process—once the customer submits their information and sees the Thank You page, we recommend you send them a series of two emails along with an SMS text message. Email #1: restates the exact same information from the Thank You page. The recipient should receive this immediately after submitting their information on the opt-in page. Email #2: states the benefit of claiming the offer and reminds them it’s expiring soon. The recipient should receive this two days after email #1. The idea of the text message is it puts the tracking phone number in the prospective customer’s hands, removing the barriers of signing up while encouraging them to call the business right away. Very great post. I just stumbled upon your blog and wanted to mention that I have really enjoyed browsing your weblog posts. and Iam hoping you write again soon! Thank you so much for your kind words! Stay tuned for more good reads.